In short, you can use NFC stickers to give your app a physical presence or trigger. 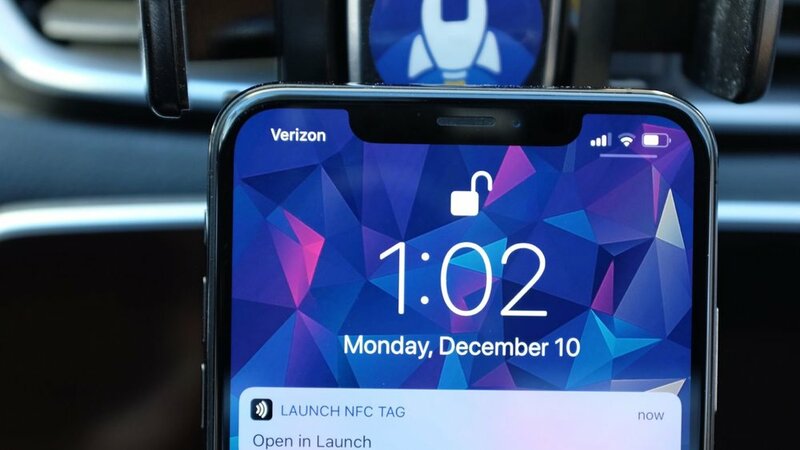 NFC-enabled iPhone and Android devices alike can take advantage of NFC stickers – thin, flexible, fully customizable stickers which contain embedded data much like QR codes. Unlike QR codes though, these stickers can wake your phone (iPhone XS) and launch your app automatically. You can even program specific tasks for your app to perform, based on which sticker is used. If a NFC sticker is scanned by a user who does not have your app installed (iOS) the system will load your web page instead. You can also associate them with in-app content such as in-game keys or collectible creatures. Is your app designed to be used on the road? Sell a car mount to your users, with an NFC sticker to launch your app in ‘driving’ mode! Several options exist for bulk orders of fully-customized tags, some even come pre-programmed. I recommend buying several options on Amazon to get a feel for what you like before you order in bulk. So how do you get NFC added to your app? You’ll need to design stickers, assemble the data which you’d like the chips to be programmed with, implement universal links within your app, and finally add the background entitlements needed to monitor for NFC chips while the device is powered off. If you’re thinking about adding NFC to your product, contact me and let’s chat! Perhaps it’s something I can help with.